Фирма "Aircraft Operating Company" занимавшаяся работами по заказам Британского картографического управления, самостоятельно разработала техническое задание на самолет для аэрофотосъемки. Проект был разработан "de Havilland" под обозначением DH.67, но из-за ДальшеMore>>> загруженности фирмы другими работами его доработку и производство поручили "Gloster". Двухстоечный биплан цельнометаллической конструкции с полотняной обшивкой имел шасси с хвостовой опорой и был оснащен двумя двигателями Bristol Jupiter XI, установленными на нижнем крыле. Экипаж состоял из пилота и фотографа, который мог вести съемку с рабочих мест в носовой или хвостовой частях фюзеляжа. Внутри последнего оказалось достаточно места для размещения даже фотолаборатории, и Фолланд, отвечавший на "Gloster" за эту машину, предложил альтернативные варианты, предусматривающие размещение пассажиров, раненых или груза, в надежде на коммерческое использование самолета. Получивший обозначение Gloster AS.31 Survey, первый самолет (G-AADO) поднялся в воздух в июне 1929 года. В начале 1930 года его перегнали в Кейптаун для проведения картографирования. После завершения этой работы самолет был куплен ВВС Южной Африки и использовался для аэрофотосъемки до 1942 года. Второй и последний экземпляр машины (K2602) был построен "Gloster" для Министерства авиации и в конце 1931 года передан испытательному центру в Фарнборо, где прослужил почти пять лет. FOUR complete aircraft will be exhibited on this stand, and in addition, there will be on view a large series of metal wings showing the development of Gloster all-metal aircraft construction dating back to 1917, and illustrating in the most convincing manner possible, the progress made during a period of more than ten years. 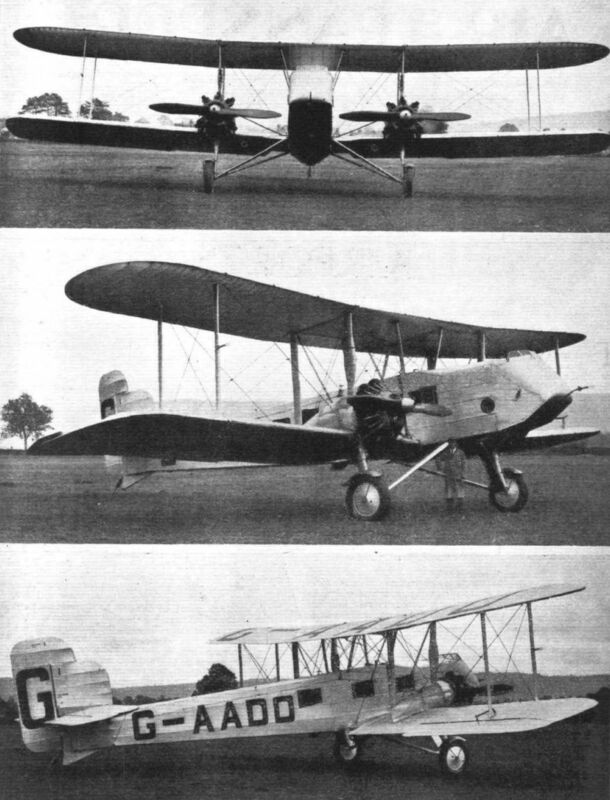 The four complete aircraft to be exhibited are: A twin-engined air survey machine (to be shown in skeleton), a "Gnatsnapper" single-seater shipplane, another Gloster single-seater fighter, and the little "Gannet" single-seater light 'plane designed for the Lympne competition of 1923. 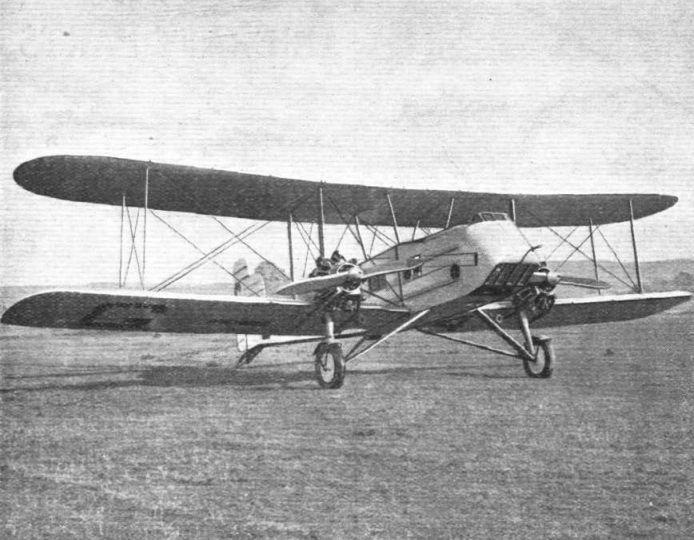 The air survey machine is a biplane, and was designed as a landplane to fulfil the special requirements of air survey work, but it can be adapted as a seaplane if required. It is fitted with two Bristol "Jupiter XI" commercial type air-cooled radial engines, giving 465 h.p. at 2,000 r.p.m., or the following engines can be fitted instead :- Siddeley, geared "Jaguar," Pratt and Whitney, "Hornet," or Wright "Cyclone." The machine is of metal construction throughout, and the position of the cockpit is designed to give the best possible forward view for photography. Special attention has been paid in design to the construction and the subsequent treatment of materials in order to withstand all types of climatic conditions. Also, special attention has been given to the general and detail design, in order to reduce cost of maintenance to a minimum, and to obtain easy accessibility and quick detachability. 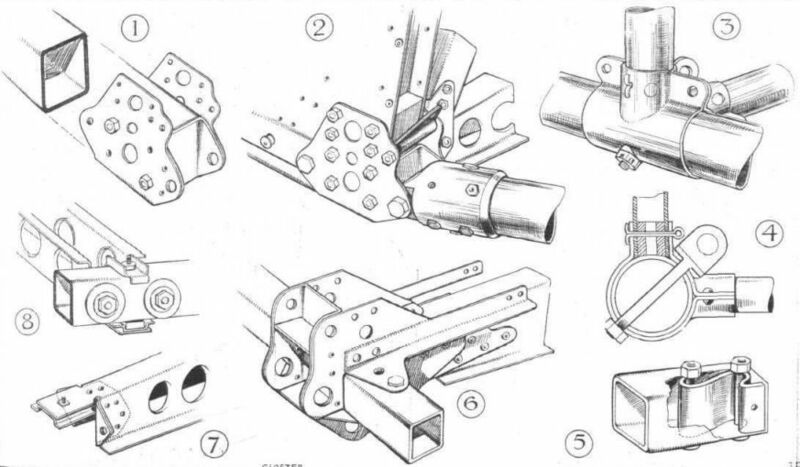 Large components being designed in detachable sections in order that ease in transport is obtained. The fuselage is constructed in three detachable sections, mainly of steel and duralumin, suitably braced and faired off with fabric and panelling. The two front portions are built up of square-section tubing with very simple flat plate joints, the rear portion being of round tubing, with joints of the standard Gloster pressed-wrapper plate type. The wings are of orthodox design, having spars constructed of high-tensile steel, using the Gloster patent lattice spar construction. The ribs are of duralumin. 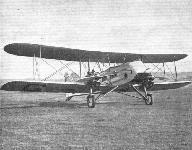 The Gloster Patent lattice spar has been under development since 1923, and is specially suited for thick wings, bearing in mind strength/weight ratio, rigidity to resist deflection and vibration, cheap construction, ease of assembly, ease of replacement of any part of the wing under service conditions, and torsional rigidity. With the Gloster lattice spar, the full depth of wing is used, thus obtaining the full advantage of the depth of section for strength purposes, and bridge pieces are formed in order to receive the duralumin rib sections which are attached by special bolts. The ribs are attached to the spars in three sections, leading edge, centre section, and trailing portion. Therefore the ribs, if damaged, can be easily replaced. In fact, the whole assembly is such that with a working diagram, a wing could be readily put together under normal service conditions. The method of fixing the fabric to the wing ribs in the slipstream has also been given careful consideration, and the Gloster patented wired-on method adopted. The fabric is placed in position, together with a layer of tape, then rustless wire is threaded through eyelets formed in the rib and locked under the head of the bolts attaching the leading and trailing edges. It should be mentioned here that this method of fixing fabric has been tested in flight at the Royal Aircraft Establishment over a period of four years, and found entirely satisfactory. 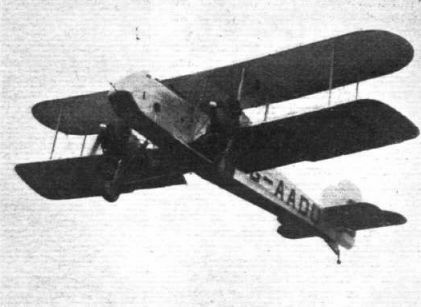 The tail plane is of the monoplane type, and is adjustable from the cockpit for various speeds and conditions of load. Its construction is H.T. steel spars and duralumin ribs. The rudder and fin are also of metal construction, and the rudder control is so designed in order to meet the conditions of dual control that the position of the rudder can be adjusted from either seat by the pilot, in order to provide directional trim with either engine "off." The undercarriage is arranged in two halves, each forming a triangulated Vee structure. This arrangement eliminates the usual long axle close to ground, which would be unsuitable for rough grounds, etc. The shock absorbers are fitted in the main short legs, and are of the oleo type, having 9-in. travel. The first impact is taken on an oil dashpot and taxying on rubber buffers in compression. The controls are of the dual type, and are of a robust nature, positive in operation, and having generous areas for all moving parts. To reduce wear, all important bearings are provided with grease gun lubricators. Tie rods are used in all cases in place of the usual stranded cables, thus giving longer life and immunity from stretch. The pilot's cockpit is placed in the nose of the aircraft, and is accessible from the main cabin by a door. It is fitted with the following instruments and equipment: Airspeed indicator, aneroid, revolution indicators, oil pressure gauges, oil temperature gauges, watch, cross level, compass, fire extinguisher (Essex type), safety belt, instrument lighting set, petrol contents gauge (Skelton), turn indicator. The photographer's cabin is equipped with special photographic equipment, three separate camera positions being provided on the machine. 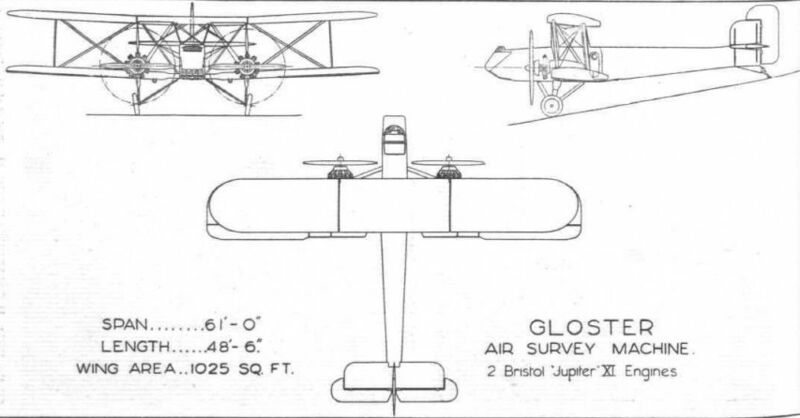 The main dimensions of the Gloster air survey machine are: Length, overall, 48 ft. 6 in. ; wing span, 61 ft.; wing chord, 9 ft.; wing area, 1,025 sq. ft. The maximum gross weight is 8,570 lbs., which corresponds to a petrol capacity of 240 gallons, an oil capacity of 31 gallons, and a survey load of 840 lbs. The tare weight is 5,615 lbs., composed as follows :- Power units, 2,270 lbs. ; tank system, 350 lbs. ; structure, 2,995 lbs. The disposable load may be divided as follows: Petrol (240 gallons), 1,820 lbs. ; oil (31 gallons), 296 lbs. Survey load (crew of two and equipment), 800 lbs. ; instruments, 40 lbs. This represents the maximum amount of fuel and, of course, maximum endurance. Normally, it will not be necessary to carry quite so much, and the normal tankage is 200 gallons of petrol and 27 gallons of oil. 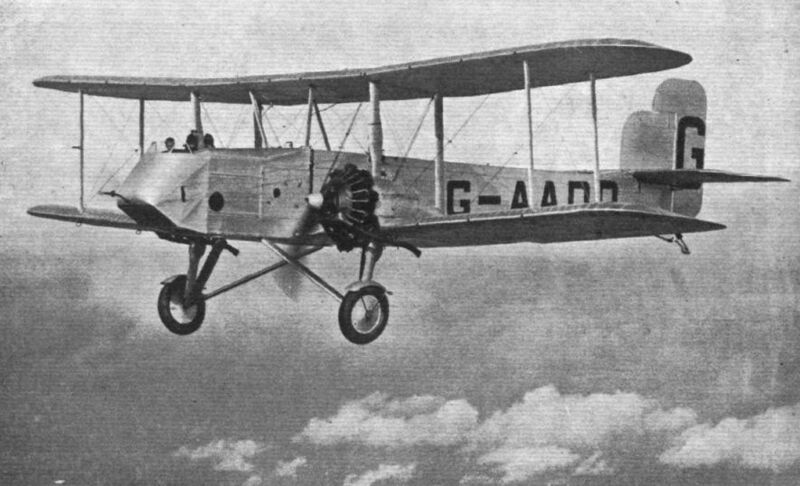 The estimated performance of the Gloster air survey machine is as follows (the figures referring to normal load): Full speed at 1,000 ft., 131 m.p.h. ; full speed at 20,000 ft., 114 m.p.h. ; absolute ceiling, 23,200 ft.; service ceiling, 21,900 ft.; stalling speed, 47 m.p.h. Endurance at 1,000 ft. (at cruising speed of 110 m.p.h. ), 4-5 hrs. Endurance at 20,000 ft. (at 100 m.p.h. ), 6-5 hrs. The last figure is over and above the time taken to reach 20,000 ft. It is estimated that the machine will not only be able to fly on one engine with normal load, but that under these conditions it will have a ceiling (absolute) of no less than 10,400 ft. With the extra tankage, the performance is not reduced to any marked degree, but the endurance at 20,000 ft. is increased to 7-5 hrs. WITH the exception of air taxy work, air survey is the only form of aviation which at the present time is real "commercial" aviation in that it pays for itself as a commercial undertaking without any artificial encouragement in the form of subsidies. 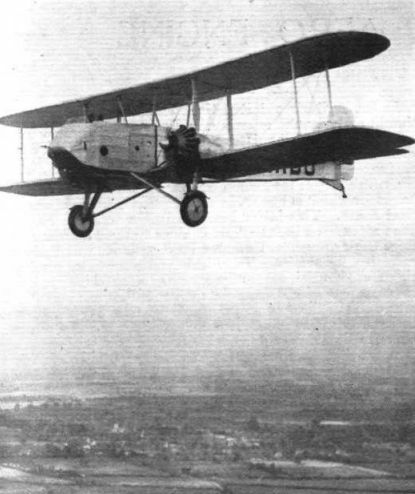 In the 1928 Annual Report on Civil Aviation, matter and statistics were given which indicate the great amount of work carried out by the twe British firms at present engaged upon air survey and air photography: the Aircraft Operating Company and the Air Survey Company. 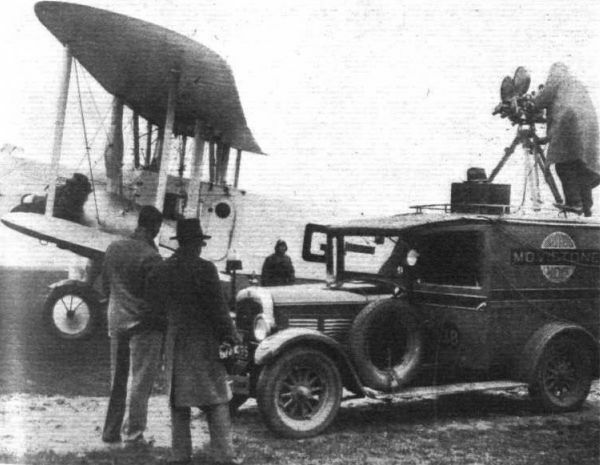 These two firms have been in existence for some years, but hitherto they have carried out their work, very successfully be it said, with aircraft not specifically designed for air survey and air photography. It was, if we remember aright, at an informal dinner of the Institution of Aeronautical Engineers that Major Hemming outlined the sort of aircraft which he would like to have for air survey work. At the time his requirements probably appeared to those present as somewhat ambitious, but the practical experience since gained, and the vast amount of work carried out, does not indicate that Major Hemming was far wrong. He has been some time in realising his ambitions, but at last the Gloster Aircraft Co., Ltd., came forward with a suitable design, and two machines of this type were laid down, one of which was exhibited (in skeleton) at the Olympia Aero Show. 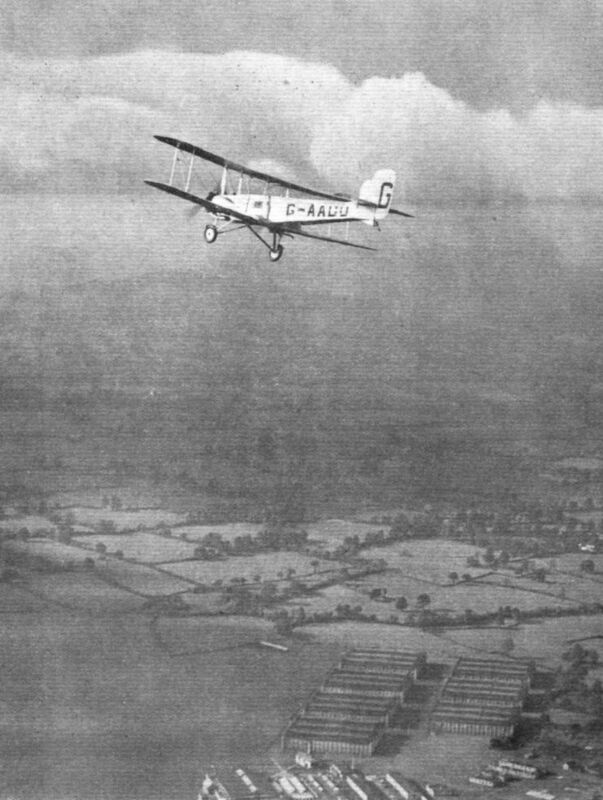 The machines have now been completed, and the FLIGHT photographs which accompany these notes show that of the Aircraft Operating Company in flight, the photographs being taken from another aeroplane. We have not yet had the official results of flight tests, and so do not know whether the predicted performance has been attained, but there is no reason to believe that the actual figures differ materially from the estimated. 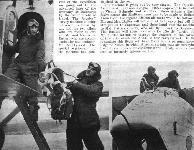 The machine actually appears capable of "flying on one engine," and even of climbing slowly with one of the engines throttled right down. 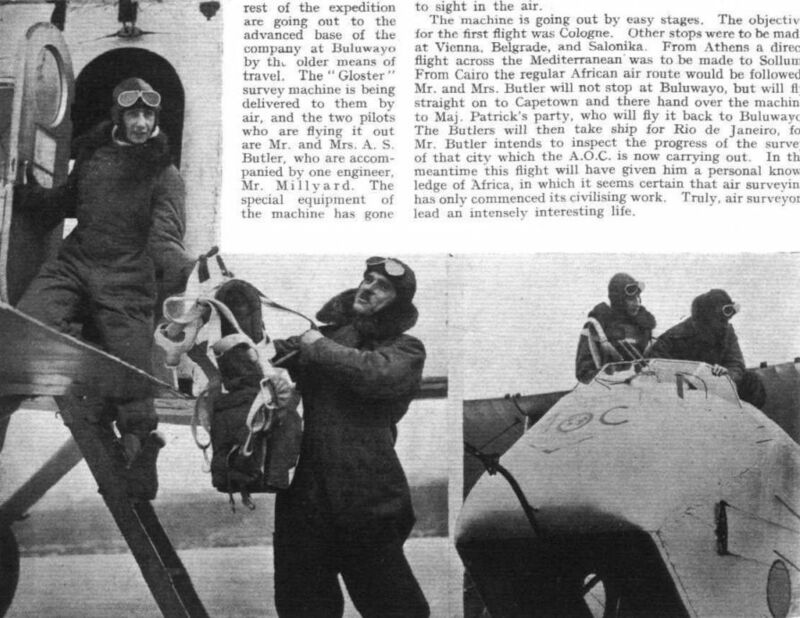 As the Gloster Air Survey machine was described in detail, and illustrated in our issue of July 11, we do not propose to give a detailed description here. It may, however, be of convenience to readers if we recall briefly the main features, etc. 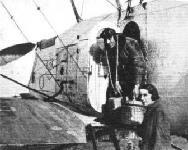 The machine is of Gloster all-metal construction, and is a twin-engined (Bristol "Jupiter") tractor biplane. The pilot's cockpit is in the nose, and the "cabin" aft of the cockpit is equipped with special photographic equipment, three separate camera positions being provided. The overall dimensions are: Length, 48 ft. 6 in. ; span, 61 ft.; wing area, 1,025 sq. ft. The tare weight is 5,615 lbs., and the maximum permissible gross weight, 8,570 lbs. The normal petrol tankage is 200 gallons, and oil, 27 gallons. The survey load (crew of two and equipment) is 800 lbs. Following are the estimated performance figures: Full speed at 1,000 ft., 131 m.p.h. ; at 20,000 ft., 114 m.p.h. ; service ceiling, 21,900 ft.; endurance at 1,000 ft., and cruising speed of 110 m p.h., 4-5 hours; at 20,000 ft. and cruising speed of 100 m.p.h., 6-5 hours. The second machine is for sale, and would make a good commercial aircraft. Воздушная фотосъемка стала новым инструментом картографов в 1920-х годах, и Gloster AS.31 Survey создавался в соответствии с требованиями Британского картографического управления. В фюзеляже была организована фотолаборатория, а основное внимание было уделено устойчивости в воздухе и надежности машины. The Gloster A.S.31 (2 Jupiter engines), which bids fair to revolutionise air survey work. 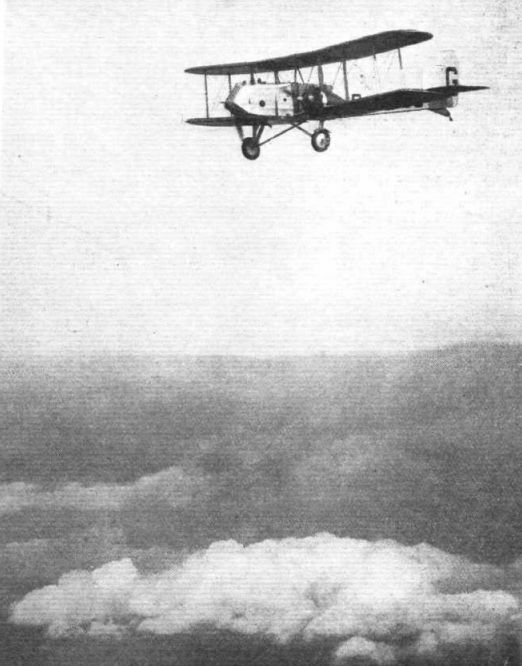 The Gloster Survey machine flying with starboard engine throttled right down, and propeller ticking slowly over. The Gloster AS.31 machine, G-AADO, fitted with two Bristol "Jupiter" engines, about to leave Cape Town for the scene of operations. 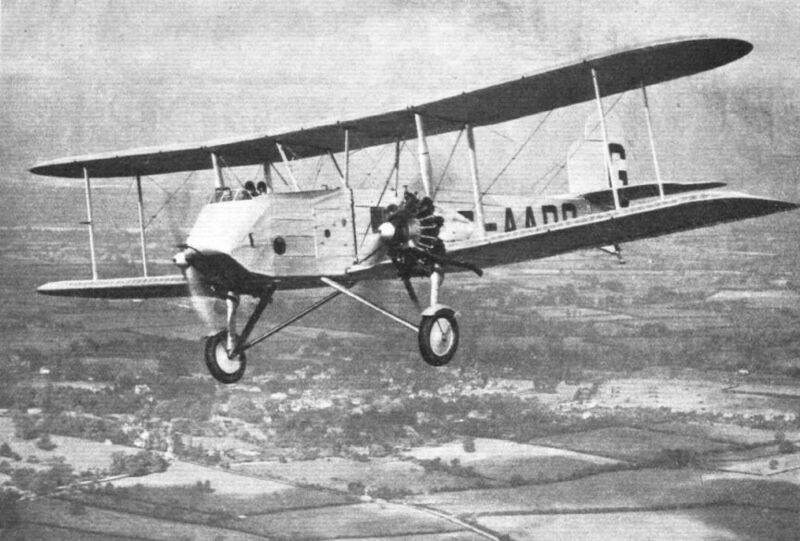 Gloster Survey machine, designed and built by the Gloster Aircraft Co. to the order of the Air Survey Co. Ltd. 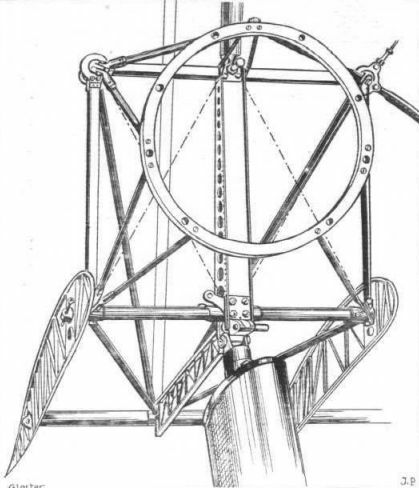 This is the first machine ever designed specially for Air Survey work, and was exhibited in skeleton form at Olympia. The machine has now been completed and doped with Cellon. THE GLOSTER AIR SURVEY MACHINE: Two of these machines, fitted with Bristol "Jupiter" engines, have been built, of which the one shown is to be put into service by the Aircraft Operating Co. The other is for sale, and would, as an alternative, be very useful as a commercial aeroplane. Lord Thomson gives his impressions of his flight to the microphone. Mr. and Mrs. A. S. Butler deplaning from their Gloster "Survey" machine at Wynbird Aerodrome, Cape Town, on their arrival there last April. The Gloster AS.31 machine, G-AADO, fitted with two Bristol "Jupiter" engines, it will be remembered, was flown out from England by Mr. and Mrs. Butler for the important survey work which the Aircraft Operating Co. had undertaken to carry out in Rhodesia. THE GLOSTER AIR SURVEY MACHINE: Contrary to general impression, this machine is for sale, and not built to the order of any particular firm. The Gloster Air Survey machine is exhibited in skeleton so that visitors may examine all the details. On the right is seen the "Gloster IV" racing seaplane. Engine mounting and undercarriage strut attachment on the Gloster Air Survey machine. 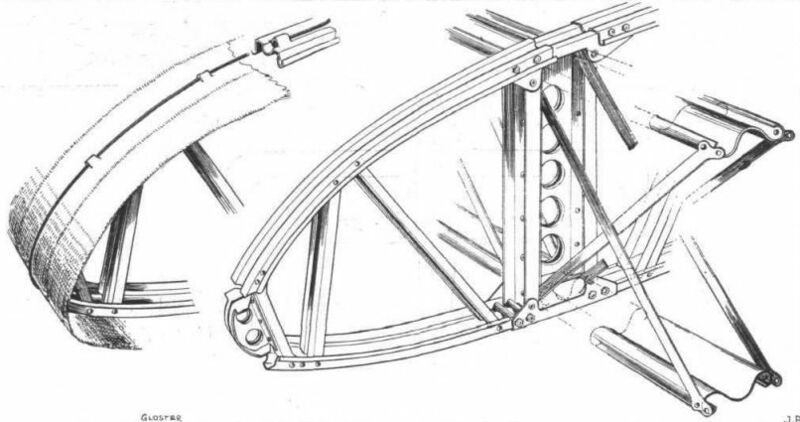 THE GLOSTER AIR SURVEY MACHINE: Details of rib and lattice spar (steel) construction. Note the method of holding the wing fabric on with a wire. FUSELAGE DETAILS OF GLOSTER AIR SURVEY MACHINE: 1, Square longerons are used in front portion, with flat-plate joints. The rear portion uses round tubes, attached to the square tubes as shown in 2, while 3 shows a typical fuselage (rear portion) joint. This is shown in section in 4. S-shaped strips are used for internal stiffeners, as in 5. Wing and chassis attachments are shown in 6, and flooring in 7 and 8.